If you have an urgent medical problem when our surgery is closed please access www.111.nhs.uk or call NHS 111 by dialling 111. If appropriate you will be transferred to the Out of Hours Emergency Service which is manned by a team of local doctors and operates from Northallerton between the hours of 6:30pm – 8:00am on week days and all day Saturday, Sunday and Bank Holidays. If your problem is not deemed to be sufficiently urgent for the Out of Hours Emergency Service, you will be advised of the most appropriate alternative service ad how to contact that service. A GP is not appropriately trained to deal with dental problems. This includes toothaches, abscesses and problems experienced after dental treatment. We cannot provide antibiotics as it is necessary to have a full assessment before prescribing such things. We would therefore suggest patients register with and regularly attend a dentist who can provide appropriate routine and emergency advice. Dentists offer a 24 hour emergency service. Out of normal surgery hours, this service is only for urgent dental treatment that cannot wait until the next working day to be treated. For emergency dental treatment outside normal working hours, registered patients should contact their dental surgery. Most surgeries have an answering machine message referring you to out-of-hours information. 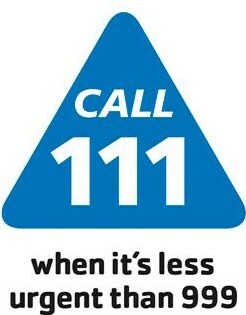 If there is no message please ring NHS 111 on 111.